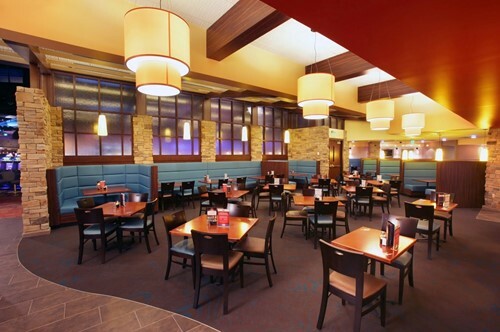 The The Blue Ribbon Grill is a American restaurant inside Hamburg Casino in Hamburg, New York. Been coming here for a few years. Never seem to win. Bonus spins are hard to get and when you do not much is paid out. Never believed that machines were FIXED but do now. Seems like the same machines only win the bigger prizes. Service is fast. Food is good at grill.workers are friendly and helpful.nice gifts. So it depends on what you cone here for. The staff that work there are the stars in this casino. But they have no ice period. I heard they have issues with keeping things cold. Maybe that's why they have no ice. If you want people coming back over and over again you have to have ice and a way to keep the food cold. If people get sick from the food you would have to shut down the buffet. The food was fabulous. But I have gone before and they have issues. Take care of the things that keep the food cold. All the people that work there are really hard working. And I have gotten to know them and they are really great people. Fix the things that need fixing before someone Sue's you over food poison. Neat, clean place with friendly people working there. A bit too much air blowing on you in some seats, but comfortable. Wouldn't we all like to win more! The Club 55 rewards have NEVER been on my card. I have to wait in line at the customer service window every week and go through this issue. They then load the reward on the card and say it should be taken care of the next time they do an update, although that has never been corrected. Last week the manager basically told me I was a liar and said his computer showed I had already printed out my reward for the week even though I had just walked in the door, checked if there were any rewards on the card (There were not, just the message "No rewards available at this time"), and walked straight to the service desk. The guy was a jerk. You would think they'd want to know that there's a problem with some of their cards or their system, but hat is not the case. On a previous visit I had received a coupon FROM THE SERVICE DESK that was unusable in any machine and it took three people and 30 minutes to figure out that they had a problem with their system. Very low payouts and equally low and poor customer service results in an unpleasant experience. Go to one of the Seneca casinos -- they're not far away and they are much better. Love that you can accumulate points pretty quickly, but their buffet is lacking. The food isn't very good. You have to go frequently to get their monthly calendar with free play and food discounts. Very frustrated that we are often left out of the free gifts. I like going to Hamburg Gaming. The employees are always nice and helpful. The games are decent and I guess I have to admit that even though I don't always win I still manage to stay and continue to give you my money. I'd like to win more, but unfortunately, I know it's called gambling for a reason. The food is always delicious and the bands are usually pretty good. The drinks are great. Thank you.